Wow, that sprint to finish the Orbital Rendersphere and the strain of running the exhibit at Maker Faire knocked me offline for a while! Things have cooled down enough that I can get back to writing. I have a proper Rendersphere project page coming up, but for now, here are five Maker Faire observations that caught me completely off-guard. Kickstarter has changed the game. It was on everyone’s lips, both exhibitors and participants. It seemed like every independent booth was hyping a Kickstarter, coasting off a Kickstarter, or gauging interest for a Kickstarter. The presence of Kickstarter, and the literal ability to sell a dream, was like a magnet that pulled the hackers to align with it. Many projects were obviously designed with Kickstarter presales in mind, and there was a lot of aggressive Kickstarter pimping afoot. Making is now a business, like it or not. A bizarre consequence of Kickstarter, people now assume that every project has a Kickstarter in its future. While this is great news for my work (and for wannabe pro hackers), it makes me uneasy for my hobby. Not every project should – or even can – be productized. One-off “just because” projects allow the hacker to mature his idea on his own schedule and produce valuable open-source artifacts. I don’t like the idea of a hacker sticking with one project just because a few people are willing to give him a few bucks. Proliferating projects allows the hacker to grow and carve out a wider comfort zone. Glass Explorers everywhere! I counted seven folks wearing Glass in Rendersphere crowds alone, and far more wandering the Faire. As much as I hate to admit, that camera was killing it. These guys were snapping pics from angles, firing voice commands to Tweet, getting video, all nine yards. I even did a full-on interview with a woman wearing Glass. She used a handheld mike and synchronized them with a little clapboard. I could write a whole article on this. Granted, the Faire vibe was extra-permissive of this kind of thing, but it was good seeing people use WearComp in public. The barbarians are at Arduino’s gates. The company’s bread-and-butter boards are at a standstill. Massimo’s focused on loony one-offs like the Yun, Esplora, and Robot. Third-party forks – cheap Chinese clones, ultra-small modules, and “Arduino-compatible” products – are everywhere. TI, Microchip, and STM have devboards with Arduino-derived syntax and IDE that blow the Uno away on paper. Arduino has to make sure its role as the most beginner-friendly devboard is more defensible, or there will be trouble. They’re still the king of the hacker devboard, but man, is that king overdue for mobilizing his armies. Hackerspaces do not take Maker Faire seriously. As far as I was concerned, the Faire is the most important two days of the MakerBar’s year. Thousands of folks in the target audience were walking by; an amazing table with a huge staff turnout could rake in hundreds of members and participants. The fact that the space could earn Editor’s Choice ribbons was gravy. The MakerBar knocked it out of the park with an exciting table and a huge flagship project, but other hackerspaces were not as impressive. I saw light-and-sound projects without a canopy. I saw tables with no flyers, cards, or publicity collateral. I saw tables in the middle of nowhere. I just don’t get it. The MakerBar handed out, I believe, a thousand cards. 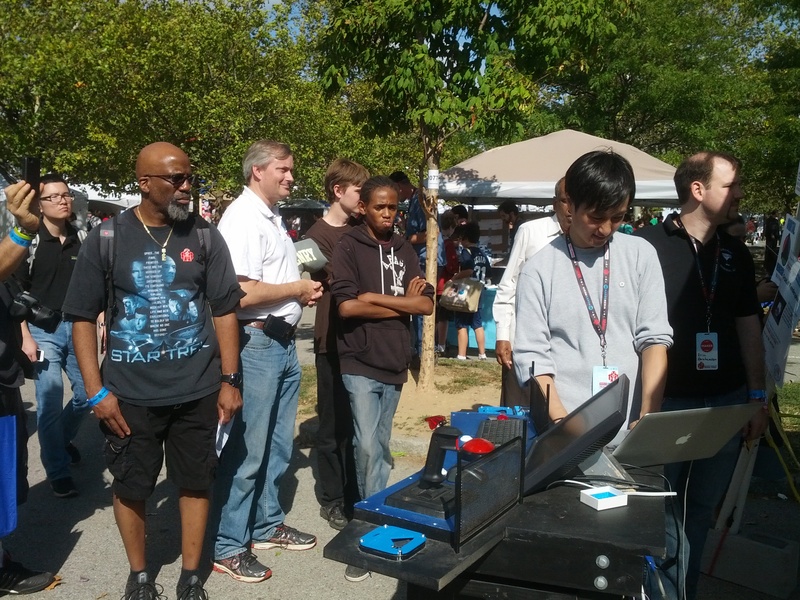 The dynamics of hacking are changing, and Maker Faire was representative of this. The clear message was that hackers are maturing. They’re realizing that conviction pays off, that they can attract a huge audience, that they can make money, that they can go deep with technology. Seeing so many Glassholes in one place, of course, always brings a smile to my face. This entry was posted in Hardware Hacking by Yours Truly. Bookmark the permalink.